The California Democratic primary is on June 7. If Bernie Sanders loses, he’ll trail Hillary Clinton by such a huge margin in both pledged and superdelegates that there will be virtually no way to make it up. But as Bernie made clear over the weekend, no, he is not going, pushing instead for probably the wildest Democratic convention any of us are likely to ever see. The polls in California are incredibly close, and Sanders could very well take the state. But, as the New York Times notes, he also said he won’t drop out even if Clinton triumphs and reaches the 2,383 delegates she needs to secure the nomination. After winning the Puerto Rico primary on Sunday, she is just 28 delegates short. According to the Associated Press, she has 547 superdelegates to Sanders’ 46. 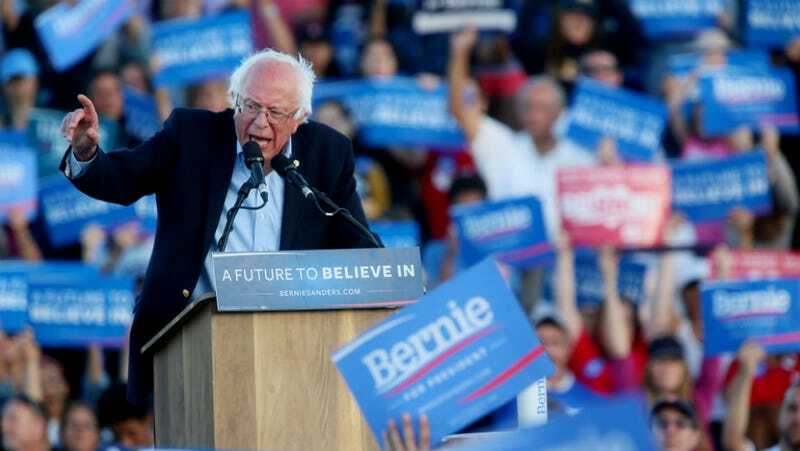 But Sanders says he plans to lobby superdelegates who have already pledged Clinton to back him instead, and that he has the money to keep running until the DNC in July. It would be over, though. It would, if that happens, by any reasonable standards, be over. Sanders has also been fighting with the DNC about the people he was allowed to appoint to the committee that writes the party platform. Sanders claimed last week that one of his picks, RoseAnn DeMoro, executive director of National Nurses United, was rejected because she was a representative of a labor union. Meanwhile, as the Democrats struggle among themselves, a terrifying, orange-hued Jenga pile composed of medical waste continues to consolidate his right-wing support.